We were recently on holiday in Germany, and while there were lucky enough to visit the Meissen Porcelain factory. It�s a fairly major tourist attraction in the town and is modern and well organised inside. 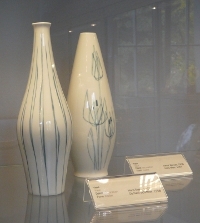 The standard ticket price includes a series of demonstrations showing how porcelain pieces are made and decorated and unlimited time exploring Meissen�s factory museum - all very interesting. What was even more interesting, from the point of view of British ceramics, was that some pieces looked remarkably similar to English pieces from the same period - a very graphic illustration of how the same design trends swept through Europe at various times. How about this? Wedgwood Jasper Ware or Meissen? 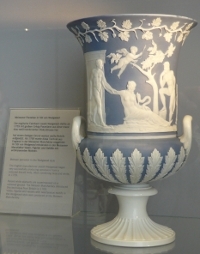 It turns out that in this case, Meissen actually did deliberately borrow the techniques that had been developed by Wedgwood to produce its own, very similar, wares. 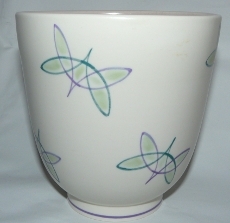 Finally, this reminds me somewhat of designs by Susie Cooper and by various British potteries in the 1950s and 60s, don�t you think? If you find yourself in the vicinity of Meissen, we would certainly recommend a visit to both the town and the porcelain factory, which is within walking of the town centre. If you fancy taking some Meissen home with you, there is a well-stocked factory shop - but be warned, this is top quality porcelain, with prices to match!